Wild Bergamot is a very very cool plant! You may have heard the common names for it as Bee Balm, Monarda and Oswego Tea. It has very pretty with flowers that are purple pink in the center and bubblegum pink petals. The correct name is Monarda fistulosa, there are many types of Bergamont but for this post we are talking about the wild Bergamot variety! It is a perennial which grows to 4 ft! So when you plant them plan correctly! The leaves have a wonderful thyme or rose geranium scent! Plant in a dry area, Wild Bergamot is very drought resistant….great for people in hot climates! You can propagate them by seed or you can divide them in the spring. You can also take stem cuttings in the summer. Easy maintenance plants….just clear dead material from plants in winter and divide plant every 3 years! Wild Bergamot has been used medicinally by Native Americans. It was used most commonly to cure colds, and was made into a tea. Use the leaves of the Bergamot for the tea, it is best to use fresh leaves picked from the plant! If you are pregnant of breastfeeding do not use these herbs. Get your water boiling, once it is done, go pick those leaves! Tear them in a few pieces and put them in your cup of boiling water right away! Steep for ten minutes then remove the leaves. If it is to strong you can sweeten with honey. 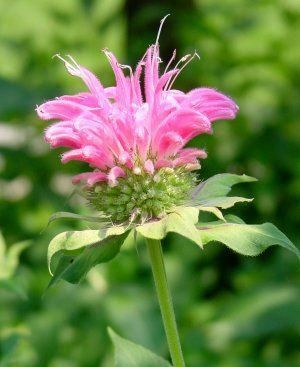 Bee Balm has also been known for its antiseptic action, It can be made into poultice for skin infections and minor wounds. It’s very easy to do! For fresh herb leaves just rub a little sunflower or veggie oil on the skin, crush the plant and place it directly on the affected area! Put a bandage over it and you have just made a poultice! Pretty cool huh? For dried herbs you can make a decoction by simmering them in a pan of water for about 5 minutes, allow to cool and then squeeze out the liquid and keep the herb to use the same way by crushing it and placing on the affected area! Easy Peasy! Because it is a natural source of Thymol which is in modern commercial mouthwash, you can use the cooled tea to gargle with! So how cool is that! It is a pretty plant, drought resistant and you can use it for a cold, skin infections, and a mouthwash! Winner winner chicken dinner! P.S An interesting thing happened while looking for some Medicinal Herbs. I looked at every nursery I could find and got the same answer, they are hard to find! So after giving up on the plants I decided to get seeds to grow, well let me tell you that was no easy task either! To find the very different and unique seeds I wanted I had to search and search many places online! I found them only to find out they were more money that some plants. It was just crazy! Finaly I found a great place I want to share with you. It is a lovely place in Alabama called Sand Mountain Herbs and talk about variety! I hope you get to try Wild Bergamot in your garden, it is so fun being self reliant! Love your theme, wish I had a garden to plant such things. Not that I ever had a green thumb. The Bergamot is particularly pretty. I find the medicinal uses of herbs very interesting. I am a minion for one of the co-hosts of the A to Z. Glad to see you have made such a great beginning. Jan, suggest you add Google Friends Connect. very enjoyable, must look out for it. Loving your posts. Advice on gardening is something I definitely need at the moment (you’d have to go back a few entries on my blog for why) suffice it to say I’m no gardener and I’ve recently jumped in at the deep end. I’m going to sign up to your blog. Good luck with the challenge!